For the record, I have never said that I believe the Democratic party is popular with the American public. My interpretation of the polls that have been coming out for the past several months is that they reflect a widespread disenchantment with ALL major institutions of power - from the government in Washington to the financial leviathans on Wall Street. Anti-establishmentarianism is the prevailing sentiment, and because Republicans are just as firmly associated with the unpopular errors of the past as Democrats (no matter how hard the GOP tries to rewrite history), it is silly for them to feel that growing political and social malaise can hurt the Democrats without also negatively affecting them. As I see it, the question in 2010 will not be which party is preferred by the American people, but rather which one is the least reviled. The contest which lies before us promises to be one of the ugliest in recent history - each party already possesses a well-stocked arsenal of denigrating characterizations about the other, and they will be used vigorously and frequently when it comes time to begin electioneering. Whether Democrats or Republicans are more fervently hated by 2010 depends on political, social, and most of all economic factors that have yet to be determined. All that is certain is that the acrimony which already marks midterm election cycles is going to be exponentially heightened this time around. Misguided? Absolutely, but not because poll data leans left, its because fools allow themselves to be taken in by alarmists and conspiracy theorists. Anybody who seriously thought that Obama was going to have death panels and turn this country into the Soviet Union is misguided, much like those who believe the moon landing was faked or JFK was killed by a "magic bullet." Political polls sway like grass in the wind, and saying that they dip one way or the other must be because of bad judgment and bad leadership instead of overt brainwashing and reactionism shows that you are probably just as misguided as the people you were so quick to judge. I'm happy to know an intellectual optimist. You might be the only one I have ever met. It's quite impressive. I actually consider myself to be a realist. The problem is that, these days, cynicism is widely mistaken for realism, and pessimism for objectivity. I do not claim that this bill is all that it could/should be; it isn't, primarily due to the toxic twinning of primitive parliamentary procedures and corrupting campaign contributions from corporate colossi. That said, the limitations imposed by these unjust circumstances forced us to choose between striving for an impossible ideal or settling for an attainable improvement. President Obama may be reviled by the left right now for pursuing the latter course, but I suspect future progressives will celebrate him for that very action. Hey Matt, I've been reading your posts and I saw that you consider yourself to be a "realist." If you have been reading some of the things that I've been saying and thinking then you would probably count me among those pessimists or cynics claiming to be realist. However I would like to defend my so-called "pessimistic" or "cynical" views if you would like to chat sometime in the near future! Here is my response to his comment, one that I think goes a long way to explaining why - despite my earlier criticisms of what I perceived as a disturbing streak of centrism in Obama's presidency - I am beginning to come around to the president's point-of-view. I'd be delighted to chat with you in the near future. Before doing so, however, there is a point that needs clarification: Insofar as the Senate health care bill is concerned, I do NOT believe that it is the ideal piece of legislation. Its lack of a public option, its blatant giveaways to Big Insurance, its inadequate attention to protecting abortion rights, and its failure to place a greater emphasis on offering preventative care to all Americans are just a few of its major shortcomings. There are many problems in America that this bill fails to resolve, and I share your disappointment on that front. That said, liberals today are susceptible to a form of bitterness that, though sympathetic, is still extremely counterproductive. Since the 1980s, the right-wing philosophy pioneered by Ronald Reagan (and given life extensions by George H. W. Bush, Newt Gingrich, and George W. Bush) has dominated America's ideological-political paradigm. During that time, liberals who fought for social, economic, and international policies that were in strict accordance with our ideological values were viewed as latter-day Quixotes, doomed not merely to failure but political irrelevance. "Compromise" became the by-word of viability within the Democratic Party, and an accomodationist, or "centrist", philosophy emerged as our limp rebuttal to the continued aggression and successes of our extreme right-wing advesaries. This was made manifest by the futility of our opposition to Reagan in the 1980s, the blatant appeasements of the DLC and Bill Clinton in the 1990s, and the spinelessness of the anti-Bush opposition during the 2000s. Yet the election of Barack Obama, liberals everywhere believed, changed all of that. The Reagan ideology, which had been brought to its zenith under the Bush administration, had been discredited by its horrendous failures in policies foreign (the war on terror, Iraq) and domestic (deregulation of big business, disempowerment of labor, and tax cuts to the wealthy, all of which caused this economic collapse). Now that an unambiguous liberal had been elected to the presidency - with a decisive electoral mandate, large majorities in both houses of Congress, and a full-blown crisis to give him all the political fuel he could possibly need to make sweeping progressive changes - it seemed that, at last, we would have to compromise no longer. If life were a storybook, that would have indeed been the case. Yet even as Obama has taken tremendous steps toward improving the state of this union at home and abroad, all on the platform of a liberal governing philosophy (the significant winding down of the war in Iraq, the increased coherency of our international philosophy even in light of our military escalation in Afghanistan, the tremendous improvement in our diplomatic relationships with other nations, the gradual economic recovery that is slowly but definitely underway as a result of the stimulus measures both already in effect and soon-to-be-in-effect, the increase of financial regulations after three decades of excessive doling out of power to big business, to name only a few), the sad truth is that the same political obstructions which impeded left-wing progress pre-2008 were not entirely swept away by Obama's election. If Obama wished to get anything done, he had to find some means of accomodating them, and while I sometimes believe the measures he undertook went too far in that direction (such as excessively watering down his stimulus package, a larger one of of which would have accelerated the end of this recession), in other cases he had no choice but to choose between half-loaf or nothing at all. Such was the case with health care reform. Although I do not deny this bill's shortcomings, the reality is that the power of conservative Democratic groups like the Blue Dogs and the DLC, the existence of pro-obstructionist parliamentary procedures such as the rules governing filibusters, the continued undemocratic influence of big business in our political life, and the maniacal zeal with which right-wingers have opposed Obama every step of the way, combined to make it necessary for him to either stalwartly fight to pass everything we ever wanted - and thus guarantee defeat of the whole package, much as happened to Bill Clinton in 1993-1994 - or make concessions in order to get the best bill possible passed. Of course, the former action would have endeared him to liberal die-hards such as us; the latter path, however, has made it so that, in January 2010, President Obama will sign into law a bill that will make it illegal for insurance companies to drop patients who become sick, end the practice of denying coverage to those with pre-existing conditions, ban the charging of excessive premiums based on gender and health status and age, end annual or lifetime caps on benefits, help cut skyrocketing health care costs and thus reduce on our crippling deficit, and provide affordable insurance to more than thirty million Americans who currently lack it over the next ten years. If Obama was merely interested in looking like a fighter for change, he would have become a liberal martyr by fighting valiantly for everything and losing to the windmill; because he is interested in actually bringing about substantive, positive change, he has allowed himself to be perceived as weak by his own base in order to do what was politically necessary to make it happen. That may make him an inadequate ideologue, but I suspect history will deem that it made him a good president. So once again, am I happy with every particular in this bill? Of course not - there is much that it lefts undone, and when our generation inherits the reins of power, we will need to pick up where it leaves off. That said, I am aware enough of the dangers of irrational bitterness and pride to acknolwedge that what the bill DOES accomplish is quite significant, and thus celebrate its passage even as I rue its deficiencies. Permit me to ask one question about the bill, does it or does it not require everyone to buy insurance? "Individuals must purchase insurance or pay a penalty that would be the greater of $750 or 2% of income by 2016. "The bill would set up new insurance marketplaces — called exchanges — where people without access to affordable coverage through an employer could purchase comprehensive plans. Tax credits would be available on a sliding scale for individuals and families who earn up to 400 percent of the federal poverty level ($88,200 for a family of four)." Translated, this means that people would be required to buy insurance, but the government would offer subsidies to those for whom insurance plans are unaffordable so as to make it financially feasible for them to acquire them. A program very much like this already exists in Massachusetts. Second Reply - The main problem with this is that the details of how this plan would effect individuals in different socio-economic brackets have not been released. For this, I blame not Congress, but a shockingly indifferent media - after all, the details are already written in the bills passed by the House and Senate, and the media (because its own members aren't really affected by those provisions) simply isn't reporting them to the general public (which is very much affected by them). Should the bill not make it affordable for every American - rich, poor, employed, unemployed, young, old, and everything between - to have insurance coverage, it would indeed be a disgrace. Indeed, should ONE person be forced to suffer because they are required to buy health insurance that they cannot afford lest they pay a substantial fine, this bill will go down in history as one of the greatest travesties of justice in recent American history (and some Thoureauian civil disobedience will be in order). That said, we do not yet know whether that is the case, and while being concerned is definitely warranted, outright opposition is premature. For what it's worth, I suspect that the truth is neither as bad as our worst fears nor as good as our greatest hopes. Incidentally, I think it would be far better to just have a single-payer health care system. It's simpler, cheaper, more efficient, and guarantees high-quality coverage to everyone. This alternative will quite likely be better than what we have now, but falls far short of what countries like Germany, Sweden, Canada, and the United Kingdom possess. It began while I was furiously debating my friend Alyssa about our nation's best and worst presidents. At first the conversation yielded few surprises, with me providing the responses one would expect from a liberal (Franklin Roosevelt as the best, Ronald Reagan as the worst) and her offering the answers one would predict from a conservative (Ronald Reagan as the best, Franklin Roosevelt as the worst). Given my respect for Alyssa's intelligence and my enjoyment of her online company, the dialogue remained friendly - that is, until she made a selection for the slot of "Fifth Worst President". It was one by which I simply could not abide. "5. Chester Arthur - I can never remember that he was even president!" Unbeknownst to her, more than four years earlier, I had written an op-ed piece in my college newspaper called "Why You Should Care About Chester Arthur". Before she could write another word, I used my feline Googling reflexes to find, copy, and paste that entire editorial into our Instant Messenger conversation. When you flip through the pages of a history textbook, you will come across a funny-looking man with muttonchops. His hair is black with a silver hue, and his skin is pasty white; his cheeks are chubby, his lips are thick, and his eyes and nose both seem to project that air of aloof sophistication which conjures up all of the most unpleasant feelings one gets from the elitism of Victorian America. Why should you care about this man? Further research will tell you that his name was Chester Alan Arthur, that he was the 21st President of the United States, and that he served for just under four years, from September 20, 1881, to March 4, 1885, but the question still remains – why should you care about him? The answer to this question lies in his story. The early years of Chester Arthur's life yield nothing extraordinary about his character. He was born on October 5, 1829 in Fairfield, Vermont, the first son in a family of nine. His father was a Northern Irish immigrant named William who – in his career as a pedagogue and Baptist minister – moved his family through dozens of small villages in Vermont and upstate New York. Young Chester developed into a very good student with a passionate interest in politics, so much so that, when he was fourteen, he found himself fervently supporting Whig statesman Henry Clay in the 1844 presidential election. By the age of eighteen, Chester Arthur had graduated from Union College in Schenectady, New York, and by the time he was twenty-four he had become a partner in a New York City law firm. Soon Arthur's political activism began to bear fruit. In 1854 Arthur attended an important meeting that helped establish the New York chapter of the burgeoning Republican party. One year later, Arthur made a name for himself as a rising young attorney when he won a landmark case in New York City that granted African-Americans the right to ride on all of the city's streetcars. By 1859, Arthur's political connections and prestige had landed him a position as state engineer-in-chief with the rank of brigadier general in the administration of newly-elected Republican governor Edwin D. Morgan. When the Civil War broke out in 1861, Arthur served the state of New York in various political capacities, first helping to outfit the New York militia and later serving as the state quartermaster general. It wasn't until the Civil War ended that a darker side of Arthur's character emerged. It was at this time that Arthur became friends with Roscoe Conkling, a New York Senator of unsavory reputation and vast influence throughout the Empire State. As the head of the state's Republican party, Conkling was known for his widespread application of the highly corrupt spoils system, and Conkling clearly saw in Arthur a man who could be used to further his own political goals. In 1871 Conkling convinced President Ulysses S. Grant to appoint Arthur to the position of collector of the New York Custom House. With more than 1,000 employees, the New York Custom House was the largest federal office in America, and Arthur's position as supervisor of import duty collection gave him enormous power within that institution. It was a power that Arthur used for gross political ends. Arthur used his newfound authority to give most of the jobs under his jurisdiction to Republican party workers, and required that all customs employees pay a portion of their salaries to Republican funds. Money collected for customs violations often found its way into the Republican treasury, and through his position as chairman of the Republican state committee, Arthur managed to transform a vital artery in America's economic system into his own personal fiefdom. It wasn't until Arthur was suspended (and then fired) by President Rutherford Hayes in 1878 that his fiefdom was dissolved. It seemed that Arthur's political career had ended in disgrace, and indeed nothing that occurred prior to his presidency seemed to indicate otherwise. In 1880 Arthur was nominated to the Vice-Presidential slot of the Republican party solely to appease Roscoe Conkling, whose efforts to get the corrupt Ulysses S. Grant nominated for a third term had failed. Running alongside the moderate James Garfield, Arthur stood on the sidelines as the Ohio Senator-elect won in a squeaker against the Democratic candidate, General Winfield S. Hancock. Arthur knew that he had been selected merely as a sop to the resentful Conkling faction of his party, and it was widely assumed that when Garfield's first term in the White House had ended, Arthur would be dumped from the ticket and replaced with a more palatable choice. Then President Garfield was shot. The would-be assassin was Charles Guiteau, a madman whose support of the Stalwarts (the faction of the Republican party that supported the spoils system) had led him to believe that he was entitled to an appointment as consul of Paris. When this appointment was denied, he became convinced that he had been betrayed by Garfield, and that only a Stalwart could be relied upon to appoint him. So it was that, on July 2, 1881, Charles Guiteau shot James Garfield in the back. Upon being apprehended, Guiteau shouted out ""I am a Stalwart and Arthur is president now!" For more than two months Garfield languished in agony as surgeons unsuccessfully attempted to remove the bullet from his back. Arthur spent the larger portion of this time in his house in New York City, speaking only to those closest to him and blaming himself for Garfield's situation. When Garfield finally died on September 19, 1881, the news was rushed over to Arthur's home, and the distressed man was inaugurated at 2:15 am the next day. The nation held its breath. What kind of president would this product of the spoils system become? Would he betray the moderate policies that his two predecessors had gradually begun to embrace? Contrary to popular presumption, Arthur became a liberal. He soon passed the Pendleton Civil Service Act, which dealt a body-blow to the spoils system, and cracked down hard against rampant postal route fraud, in spite of the fact that some of the scandals involved his friends. He even vetoed a bill that was intended to improve America's waterways, accurately perceiving that the funds proposed for allocation were extravagant. His other positions likewise found him on the side of the angels: His foresight in modernizing the American navy; his attempts (somewhat unsuccessful) to protect American consumers by lowering import tariff rates; and his efforts to permit Chinese immigration when Congress attempted to ban it for twenty years (he eventually wheedled them down to ten). His only significant failure as president occurred about one year into his term, when he decided not to disclose the fact that he had been diagnosed with Bright's Disease. Bright's Disease is a severe ailment of the kidneys, and the prognosis was bleak for one afflicted with it at Arthur's time. Despite possessing this knowledge, Arthur sought the Republican presidential nomination in 1884, but was defeated by popular Senator James Blaine. Arthur eventually succumbed to a cerebral hemorrhage, and died in 1886, less than two years after his presidency had ended. This brings me back to the original question: Why should you care about Chester Arthur? One obvious reason lies in the fact that he helped to sow the seeds that would eventually grow into the Progressive Era. More subtle than that, however, is the manner in which he epitomizes the complicated anatomy of the human soul. In the course of his life he demonstrated both the manner in which good men can be corrupted by wealth and power, and how these men can redeem themselves from their vices. Arthur may not be the most virtuous of American presidents, but he possessed greatness when he needed it the most, both for himself and for his country. That is why I believe that the man in the picture you see in your history textbook – the obscure man with a bland name and a snobbish aura all-too-common among Gilded Age politicians – deserves to be remembered as more than just a footnote in the litany of obscure American presidents. He deserves to be remembered, not just for who he was, but for what he can teach us about America, and about ourselves. "I am but one in 55,000,000; still, in the opinion of this one-fifty-five millionth of the country's population, it would be hard to better President Arthur's administration. But don't decide till you hear from the rest." "AHHHH! What are the odds that I'd pick the one president that you wrote about?" Actually, I've written absurdly detailed articles about quite a few of our presidents (and presidential history in general)... but I figured I'd tortured the poor girl enough. For those who might snicker when statements like "great eyes" and "honor" are made in reference to Joe Lieberman, they should recall that this was a man who risked his life helping African Americans register to vote in Mississippi during the 1960s, who has braved condemnation from fellow Orthodox Jews for his pro-choice stance, and who broke the barrier keeping Jews out of national executive office by accepting Al Gore's offer of the vice presidential nomination in 2000 (another Jewish Connecticut Senator, Abraham Ribicoff, turned the slot down when it was offered to him by George McGovern in 1972). There used to be greatness in the man, or at the very least a streak of admirable qualities. That said, his support of the Bush Administration's war in Iraq, his endorsement of John McCain in 2008, and now his spiteful undermining of health care reform have all combined to destroy that aspect of his legacy. History will not revere his older days, but will cause him to "walk backward with averted gaze" so as to "hide his shame". The title of this blog post is intentionally deceptive - the "Webster" to whom it refers is not the Noah Webster of dictionary fame, but Senator Daniel Webster, a Massachusetts statesman widely regarded as one of the greatest orators to ever grace that legislative body (although, ironically, the two Websters did share political views on most subjects). Shortly after writing my two-part "On Unions" articles, I decided to include a brief and reworded excerpt from one of them on my Facebook page. Needless to say, a vigorous debate ensued, one that I have seen fit to post in full below. "There is not a more dangerous experiment than to place property in the hands of one class, and political power in those of another... If property cannot retain the political power, the political power will draw after the property." While conservatives and liberals agree on this, the former use it to justify giving the rich disproportionate political power, while the latter wishes to establish economic democracy. Matt, that's an incredibly simplistic description of an incredibly complex reality. It's also, frankly, inaccurate and unfair. I'm more of a moderate than anything else, and I am continuously disappointed by the efforts of those of all political persuasions to demonize their opposition. Actually, moderate is a bad way to describe me. I'm more of a libertarian with some handpicking from both sides of the aisle. Kevin, I don't view my comment as being in any way unwarranted. When conservatives support "supply side" tax policies, deregulation of big business, and the disempowerment of labor unions, they pursue policies that can only have one possible outcome - the concentration of political and economic power in the hands of the wealthy at the expense of the middle and working classes. The only difference between the right-wingers of Daniel Webster's era (the quote above comes from a speech delivered by the great Massachusetts orator in 1820) and their 21st century counterparts is that the former were very open about their elitist objectives, while the latter - having brilliantly interwoven populist cultural themes and a knee-jerk distrust of "big government" into their message - are able to come off as egalitarian. Incidentally, I have a great deal of respect for the politically independent-minded (which is how you describe yourself), and am by no means a left-wing ideologue. On economic subjects I am a liberal in the tradition of Andrew Jackson and Franklin Roosevelt; on social issues my sympathies are strongly libertarian; and on foreign policy I am left-of-center, supporting the humanitarian internationalism of Woodrow Wilson and Harry Truman. That said, my personal open-mindedness doesn't include a reluctance to "call 'em like I see 'em". While I respect honest differences of opinion, I resent it when people claim they prefer a position for one reason when they are really driven by an entirely different set of motives. When the Federalists, National Republicans, and pre-Harrison Whigs (i.e., the early conservative parties) waxed poetically about the wonders of having a nation ruled by "the rich and well-born" and sneered at the concept of having the rest of the citizens participate equally in the political process, at least they were honest in presenting what they believed and why they believed it. It is the sneakiness with which contemporary right-wingers claim they have one agenda when they in fact have another that I find so infuriating. Actual conservatives support a lack of intrusion by the government into the daily lives of citizens. The Republican party has repeatedly shown this to not be one of its core ideals (in action, if not in words). Actual conservatives support less government spending (part and parcel of smaller government). Same deal as above regarding the Republican party. If you are equating Democrats with liberals, you are equally wrong (in my opinion). Real liberals encourage everyone to have an equal voice in government. The Democratic party encourages everyone who AGREES with them to have an equal voice in government (the Republican party is just as bad). The Democratic party, for all its talk of empowering the non-wealthy of the country, was instrumental in the concentration of yet more wealth in the hands of those who already have it (TARP money, among other things). Matt, as I said in the beginning of this post, perhaps our difference is a matter of definition of terms rather than ideals. I tend to see both major parties as shills for the wealthy and powerful rather than as representatives of the people of this country. I think your characterization is simplistic here. The Democratic Party is a motley crew of old-fashioned New Deal liberals, New Leftists, Blue Dogs centrists, big city machine politicians, and countless other ideological (to say nothing of cultural and demographic) factions. There is no "Democratic" philosophy, anymore so than there is a "Pennsylvanian" philosophy. One of the key reasons Democrats have had such a hard time passing meaningful legislation is that, since the disintegration of the New Deal coalition in 1968, the presidents produced by this party have had to try to whip into shape a coalition so inherently fractious that there is very little upon which they can agree. Republicans, on the other hand, were built into a very powerful and effective political organization by Ronald Reagan and his conservative movement during the 1980s (which was then carried into the future by Newt Gingrich in the 1990s and George W. Bush in the 2000s). By purging all but a handful of the moderates and liberals who used to make up a sizable chunk of their membership, as well as exploiting reactionary cultural positions and falsely conflating them with their economic and international agenda following the 1960s, the Republicans figured out a foolproof formula for not only dominating the last three decades of American political history, but also of becoming an ideologically cohesive group. And what of the conservatives who you say differ from the Republicans on these particulars? While I do not doubt that they exist, they are so few and far between that it is painful. Take, for instance, the "Tea Party" protesters who claim that they are "true conservatives" who never liked George W. Bush but now object to the taxation policies of Barack Obama. If that is really the case, then where were they when Bush spent trillions of dollars on an unnecessary war in Iraq? Where were they when millions of dollars meant to help New Orleans after Hurricane Katrina were used on - well, we still don't know what? Why didn't they get up in arms against Bush when he squandered Clinton's budget surplus early in his presidency on a tax cut that primarily benefited the rich? The fact of the matter is that the so-called real conservatives didn't have a slight problem with George W. Bush when he flouted the principles on which they stood (or if they did, they were surprisingly silent about it), and only began distancing themselves from Dubya when his political stock began to plummet during his second term (although they couldn't get enough of him during his first term, convenient revisionism aside). Obama, on the other hand, they began to oppose almost from the first day he took office. In short, if conservatives want to be viewed as separate from the Republican Party, they need to distance themselves from that party on occasions OTHER than when it happens to be unpopular with the rest of the country. Until then, I consider the vast bulk of the conservative movement to be interchangeable with the GOP. I'll grant you that. People have a tendency, it seems to me, to flock to whatever banner purports to support their cause (even if the reality is very different). Often they do this because the people carrying said banner look like them. As a corollary, I would argue that those people calling themselves true conservatives (the Tea Party types) are blatant dupes of those who have absolutely no stake in their true best interests. They hear someone who claims to be like them say, "They're going to take your money and give it to people who don't work. They're going to decide what kind of medical care you can have. They're going to enforce euthanasia on the elderly. THEY THEY THEY!," and they believe what they are told without ever looking into it for themselves. Whether those people are true conservatives or not, they are woefully (sometimes willfully) ignorant. Ra Ra Kevin. It is a rare bird who recognizes the true nature of the conservative view. It is indeed, Kevin. Kudos to you. Out of curiosity, have you ever read the memoirs of Barry Goldwater (co-authored by Jack Casserly)? It seems like you would enjoy them quite a bit. I haven't. I'll have to look around for a copy. Anyway, I have to run. Time to conduct another appointment. I would also highly recommend "The Conscience of a Conservative", another book by Barry Goldwater. I meant to mention it in my last post but forgot (hence the misused "them"). After agreeing tentatively to jettison a key liberal priority — a full-blown government-run insurance option — Democrats say they are getting close to pushing President Barack Obama's health care bill through the Senate. As I have stated many times before, it is illogical for any society that cherishes freedom and human rights to allow any one of its citizens (much less thirty million) to be denied high quality health care. It is a grave moral wrong for any human being to not receive the medical treatment he or she needs to survive and/or maintain a decent quality of life; likewise, it is nothing short of an atrocity for any human being to have to undergo financial suffering simply because he or she became sick. That is why many countries - like Japan, France, Sweden, Greece, Switzerland, Canada, Great Britain, Germany, and Israel - have made a point of guaranteeing health care to all of their citizens. Although the systems of universal health care provided in these nations have their various imperfections, all of their citizens are united in consistently expressing preference for their current system over a privatized one (oh, and in the fact that each one outranks the United States both in the quality of health care provided and in overall cost efficiency). However, because insurance and pharmaceutical companies are allowed to exploit the American public which depends on their services, the injustices that have been eliminated in other first world countries remain commonplace in our own: insurance premiums are made so costly that millions of Americans can't afford them, those who can afford insurance still often wind up being financially crippled through out-of-pocket expenses, millions of others who are covered by insurance companies are often dropped as soon as they become sick or a pre-existing condition is discovered, and the prices of prescription drugs continue to rise at exorbitant rates. In a world in which both sides of this debate were required to be honest about their motives, it is difficult to imagine the depraved reasoning of Big Medicine - that they have a right to cause human suffering as a means of earning money, that their God-given freedom includes becoming the medical world's equivalent of war profiteers - being greeted with anything but contempt. Unfortunately, well-placed political contributions, a brilliantly orchestrated lie-and-fear based propaganda campaign, and the mindless dogmatism of a veritable army of right-wing zealots have all combined to give their cause the facade of moral and intellectual legitimacy. Now, thanks to their efforts, a public option - the single most viable route through which America could have obtained universal health care - has been rendered impossible for the foreseeable future. It is easy to feel not only angry at the reactionaries who opposed necessary change, but betrayed by the Democratic politicians - the ones who were supposed to be fighting on our side - for allowing them to stand in the way. This famous remark by Prussian Prime Minister Otto von Bismarck has become something of a mantra for practicioners of realpolitik. Defined by dictionary.com as "political realism or practical politics, esp. policy based on power rather than on ideals", realpolitik is frequently used to reflexively dismiss idealistic aspirations with a faux savvy sleight-of-hand that makes it a genuine threat to real progress. Indeed, the liberal movement has spent so long watching its objectives get watered down or utterly destroyed by the concessions inherent in realpolitik that it is easy to see why so many of us are infuriated at the prospect of having to do so again. The temptation begins to arise within many of us to say that - because we control the executive and legislative branches of government, have a vitally important issue at stake, and thus presumably shouldn't have to make concessions this time - we won't accept anything less than that which we know ought to be passed. It's a sentiment already being express among liberals in both the Senate (like Russ Feingold) and House of Representatives (like Dennis Kucinich, who voted against the House's health care reform bill last month). 1) Based on what we now know of the leanings of each Senator, it will be impossible to pass a public option. a) Although the Republican Party makes a point to purge from its ranks those who do not mesh with its ideological hegemony, the Democrats are much more diverse in their ideas. Consequently, even though Republicans are easily capable of uniting as a bloc either in favor of or in opposition to any measure they please, Democrats are more likely to run into a wide diversity of opinions which they need to accomodate. b) Because the Democratic Party contains members from all sides of the ideological spectrum, there are only fifty-six Senators (fifty-five registered Democrats and one independent who caucuses with the Democrats) who were willing to vote for a bill that included health care reform. The remaining four Senators (three registered Democrats and one independent) refused to get on board so long as a public option was in a bill - and while it would be possible to pass the bill with only 51 votes (meaing we already have five more than needed), it is impossible to block a legislation-killing filibuster by the Republicans (which they have already pledged to do) without at least 60 votes (of which we are four shy). Therefore, in order to guarantee the health care reform bill's passage, Senate Majority Leader Harry Reid had to make concessions to the four senators whose support he hadn't received. 2) The health care bill itself, though not addressing every problem within our system, nevertheless fixes quite a few of them. It would offer nonprofit insurance cooperatives strictly monitored by the government in order to guarantee affordable health care to all, make it illegal for insurance companies to drop you because of a pre-existing condition or after you become sick, and place price caps on how much patients can pay in out-of-pocket medical expenses or for prescription drugs. Simply put, the chances are that - thanks to the opposition of four Democratic Senators (Mary Landrieu, Blanche Lincoln, Ben Nelson, and Joe Lieberman) - we never had a chance of getting a public option at all; our only choices were a health care reform bill without that public option or no health care reform bill at all. Although some liberals, due to either pride or ideological steadfastness (or both), believe that protesting the whole corrupt system by voting against the bill might make a strong statement, such an action is only conscionable when it doesn't interfere with actual good that could be done. Because good will be done if the health care bill is passed in its current form, opposing it would simply be another way of cutting off your nose to spite your face. If there was ever a moment when I wished I had a camera, it was last Friday, when I found myself emotionally bonding with an unkempt bovine named Chief at the Turtleback Zoo in Livingston, NJ. My affinity for animals has caused some of my friends to express surprise. One saw fit to comment on my tendency to put pictures of interesting critters on my Facebook profile; others have marveled at the trivia I can spout off on zoological specimens from canines and bears to elephants and pangolins. On those occasions when someone inquires as to the origin of my interest, I find myself in an uncommon position - i.e, one in which I have no idea what to say. What I do know is that, when I reached my arm into that pen and saw Chief - a massive, unkempt, black-and-white bovine - shamble up to me, a tiny part of my soul giggled with joy. When he tentatively leaned his massive mug against my hand, and had his eyes loll to one side as I scratched him on just the right spot of his chin, I felt an unmitigated joy that exists without parallel elsewhere in my life. The copious quantities of drool that poured onto my sweater and the scratchy feeling of his tongue against my arm were not merely rendered acceptable, but made all the more worth it from the experience. The fact that logical explanations eluded me then - and still elude me now - was irrelevant. I was happy. Perhaps, despite my earlier reservations about offering an explanation for my feelings, one can be found in this anecdote from a biography of Senator Daniel Webster. Although the political views of the legendary orator were in many respects vastly different from my own, we certainly would have seen eye-to-eye on the unique pleasures to be had in relating to the animal kingdom. "You do not seem, my son, to take much interest in this; but, for my part" (and here he broke an ear and fed the pieces to the oxen on his right and left, and watched them as they crunched it), "I like it. I would rather be here than in the Senate," adding, with a smile which showed all his white teeth, "I think it better company." I cannot overstress the value of thinking through the implications of what you say before you begin to speak. This was a lesson that was reinforced to me today when I began griping about the new Sherlock Holmes movie. "It's going to be terrible!" I groaned to the stepmother of my best friend. "I mean, I just know they're going to change the source material, and then what? I was raised on Sir Arthur Conan Doyle. I just won't be able to handle it if they ruin it for me." She thought about this for a moment. "How will they ruin it for you?" "I mean, if the movie isn't good, that won't stop you from reading the original stories, will it?" "Well, no, but I still want them to be faithful to the original work." "But what's wrong with an artist interpreting an older piece for a new medium? Life changes, and art naturally changes it. Many great pieces of art comes from individual finding new ways to look at old material." As mass production has to be accompanied by mass consumption, mass consumption, in turn, implies a distribution of wealth -- not of existing wealth, but of wealth as it is currently produced -- to provide men with buying power equal to the amount of goods and services offered by the nation s economic machinery. Instead of achieving that kind of distribution, a giant suction pump had by 1929-30 drawn into a few hands an increasing portion of currently produced wealth. This served them as capital accumulations. But by taking purchasing power out of the hands of mass consumers, the savers denied to themselves the kind of effective demand for their products that would justify a reinvestment of their capital accumulations in new plants. In consequence, as in a poker game where the chips were concentrated in fewer and fewer hands, the other fellows could stay in the game only by borrowing. When their credit ran out, the game stopped. That is what happened to us in the twenties. We sustained high levels of employment in that period with the aid of an exceptional expansion of debt outside of the banking system. This debt was provided by the large growth of business savings as well as savings by individuals, particularly in the upper-income groups where taxes were relatively low. Private debt outside of the banking system increased about fifty per cent. This debt, which was at high interest rates, largely took the form of mortgage debt on housing, office, and hotel structures, consumer installment debt, brokers' loans, and foreign debt. The stimulation to spending by debt-creation of this sort was short-lived and could not be counted on to sustain high levels of employment for long periods of time. Had there been a better distribution of the current income from the national product -- in other words, had there been less savings by business and the higher-income groups and more income in the lower groups -- we should have had far greater stability in our economy. Had the six billion dollars, for instance, that were loaned by corporations and wealthy individuals for stock-market speculation been distributed to the public as lower prices or higher wages and with less profits to the corporations and the well-to-do, it would have prevented or greatly moderated the economic collapse that began at the end of 1929. The time came when there were no more poker chips to be loaned on credit. Debtors thereupon were forced to curtail their consumption in an effort to create a margin that could be applied to the reduction of outstanding debts. This naturally reduced the demand for goods of all kinds and brought on what seemed to be overproduction, but was in reality under-consumption when judged in terms of the real world instead of the money world. This, in turn, brought about a fall in prices and employment. Unemployment further decreased the consumption of goods, which further increased unemployment, thus closing the circle in a continuing decline of prices. Earnings began to disappear, requiring economies of all kinds in the wages, salaries, and time of those employed. And thus again the vicious circle of deflation was closed until one third of the entire working population was unemployed, with our national income reduced by fifty per cent, and with the aggregate debt burden greater than ever before, not in dollars, but measured by current values and income that represented the ability to pay. Fixed charges, such as taxes, railroad and other utility rates, insurance and interest charges, clung close to the 1929 level and required such a portion of the national income to meet them that the amount left for consumption of goods was not sufficient to support the population. This then, was my reading of what brought on the depression. History has shown that the best means of guaranteeing incomes sufficiently high among the American working class so as to guarantee adequate consumption of goods and services - and thus keep the engine of economic growth at a beautiful hum - is to cultivate a healthy system of labor unions. That is why - in addition to raising the minimum wage, passing comprehensive universal health care reform, and creating a modern day WPA via stimulus - the most important measure our government can take today would be passage of a strong Employee Free Choice Act. The following is an excerpt from Arthur Schlesinger's classic "The Age of Jackson". It addresses the first major instance in American history when a case was taken to court involving the rights of workers to unionize. For those conservative friends of mine who derive an unseemly pleasure out of attacking efforts on the part of the working class to empower itself, you should note that the incidents described below occurred in 1836 - a full twelve years before the publication of Karl Marx's Communist Manifesto. Labor has fought for its rights long before their right-wing adversaries decided to conflate them with the logical and moral errors of Communism. In the fall of 1835 the Society of Journeyman Tailors increased its rates, winning recognition of the increase after a brief strike. In January, 1836, their employers combined to roll back the rates to the original level. The tailors promptly struck again. Each side employed its weapons of picketing and black list, and fights between the strikers and the "dungs", as scabs were then called, led to considerable bitterness. When Savage rendered decision in the Geneva case, the employers took the hint and had twenty to the leader tailors arrested for criminal conspiracy. Brief note: In 1835, the National Trades Union was formed as the first effort on behalf of American laboring classes to organize for the protection of their economic rights. Later that year, a group of shoemakers in Geneva, NY organized a strike when their employers refused to pay them fair compensation for their work. The case eventually went to the New York State Supreme Court, where the shoemakers argued that denial of their right to unionize would "deprive them of the means and opportunity of learning the rights and duties which they are to exercise as citizens" and "forbid these men that union which alone can enable them to resist the oppressions of avarice". Nevertheless, the Chief Justice ruled decisively in favor of the employers, claiming that workers had no right to demand higher wages for their labor since "such practice was injurious to trade and commerce" and deeming all such efforts to constitute the statutory offense of criminal conspiracy. The strike alone constituted the offense in accordance with the Geneva doctrine; incidental violence was irrelevant in the indictment. Judge (Ogden) Edwards modeled his charge to the jury on Savage, and the tailors were convicted. William Cullen Bryant, now back in active control of the "Post", led the attack on Judge Edwards. "According to his position, a combination to take a settled price and no less, for any thing to be sold, is a conspiracy injurious to trade and commerce, and is punishable." Apply this, Bryant dryly proposed, to bankers, to owners of packet ships, to butchers, insurance directors and newspapers with their uniform rates for advertising and subscriptions. "Or will it be allowed that the law would be unjust and oppressive if enforced against the opulent and prosperous, while it is contended that it is just and equitable, when those who depend only on the labour of their hands are made its victims?" Although I readily admit to having a weakness for historical anecdotes, I do not cite this incident merely because of its individually interesting qualities. As measures like the Employee Free Choice Act are mulled over by Congress and strongly supported by progressives, conservatives and their allies among big business are outspoken in their claim that granting workers these rights would somehow constitute an infringement on their commercial liberties. The undeniable implication of their reasoning is that if a free market is necessary to the preservation of political liberty (which I agree is the case), then unions must be stopped, since workers who demand certain wages and benefits for their labor infringe on the commercial liberties of their financially powerful employers. What makes William Cullen Bryant's observation so brilliant is that, rather than identifying the deep moral wrongs inherent in their reasoning, he instead reprimands big business for their poor logic. Wouldn't big business resent it if the government ruled that they could not charge as much as they desired for the goods and services they provided? On what logical premise did they rest their claim that it was beneficial to the interest of "trade and commerce" for the rich and powerful to control the prices they demanded for their efforts, but dangerous for the middle-class and poor to do likewise? There is not a more dangerous experiment than to place property in the hands of one class, and political power in those of another... If property cannot retain the political power, the political power will draw after the property. Webster was correct in his discernment of the fundamental axiom which determines the relationship between economic power and political power. The key difference between conservatives and liberals is that the former want to use this reality to permanently consolidate in the hands of the wealthiest citizens the bulk of our political power; the latter want to guarantee that that power is always available to all of the people. First, we're proposing a series of steps to help small businesses grow and hire new staff. Over the past fifteen years, small businesses have created roughly 65 percent of all new jobs in America. These are companies formed around kitchen tables in family meetings, formed when an entrepreneur takes a chance on a dream, formed when a worker decides its time she became her own boss. These are also companies that drive innovation, producing thirteen times more patents per employee than large companies. And, it's worth remembering, every once in a while a small business becomes a big business - and changes the world. That's why it is so important that we help small business struggling to open, or stay open, during these difficult times. Building on the tax cuts in the Recovery Act, we're proposing a complete elimination of capital gains taxes on small business investment along with an extension of write-offs to encourage small businesses to expand in the coming year. And I believe it's worthwhile to create a tax incentive to encourage small businesses to add and keep employees and I'm going to work with Congress to pass one. These steps will help, but we also have to address the continuing struggle of small businesses to get the loans they need to start up and grow. To that end, we're proposing to waive fees and increase the guarantees for SBA-backed loans. And I am asking my Treasury Secretary to continue mobilizing the remaining TARP funds to facilitate lending to small businesses. Second, we're proposing a boost in investment in the nation's infrastructure beyond what was included in the Recovery Act, to continue modernizing our transportation and communications networks. These are needed public works that engage private sector companies, spurring hiring across the country. Already, more than 10,000 of these projects have been funded through the Recovery Act. And by design, Recovery Act work on roads, bridges, water systems, Superfund sites, broadband networks, and clean energy projects will all be ramping up in the months ahead. It was planned this way for two reasons: so the impact would be felt over a two year period; and, more importantly, because we wanted to do this right. The potential for abuse in a program of this magnitude, while operating at such a fast pace, was enormous. So I asked Vice President Biden and others to make sure - to the extent humanly possible - that the investments were sound, the projects worthy, and the execution efficient. What this means is that we're going to see even more work - and workers - on Recovery projects in the next six months than we saw in the last six months. Third, I'm calling on Congress to consider a new program to provide incentives for consumers who retrofit their homes to become more energy efficient, which we know creates jobs, saves money for families, and reduces the pollution that threatens our environment. And I'm proposing that we expand select Recovery Act initiatives to promote energy efficiency and clean energy jobs which have proven particularly popular and effective. It's a positive sign that many of these programs drew so many applicants for funding that a lot of strong proposals - proposals that will leverage private capital and create jobs quickly - did not make the cut. With additional resources, in areas like advanced manufacturing of wind turbines and solar panels, for instance, we can help turn good ideas into good private-sector jobs. Given the challenge of accelerating the pace of hiring in the private sector, these targeted initiatives are right and they are needed. But with a fiscal crisis to match our economic crisis, we also must be prudent about how we fund it. So to help support these efforts, we're going to wind down the Troubled Asset Relief Program, or TARP - the fund created to stabilize the financial system so banks would lend again. There has rarely been a less loved or more necessary emergency program than TARP, which - as galling as the assistance to banks may have been - indisputably helped prevent a collapse of the entire financial system. Launched hastily under the last administration, the TARP program was flawed, and we have worked hard to correct those flaws and manage it properly. And today, TARP has served its original purpose and at a much lower cost than we expected. ... as we strive to meet the crisis of the moment, we are laying a new foundation for the future. Because an educated workforce is essential in a 21st century global economy, we've launched a competitive Race to the Top fund through the Recovery Act to reform our schools and raise achievement, especially in math and science. And we've made college more affordable, proposed an historic set of reforms and investments in community college, and set a goal of once again leading the world in producing college graduates by 2020. Because even the best trained workers in the world can't compete if our businesses are saddled with rapidly increasing health care costs, we're fighting to do what we have discussed in this country for generations: finally reforming our nation's broken health insurance system and relieving this unsustainable burden. Because our economic future depends on a financial system that encourages sound investments, honest dealings, and long-term growth, we've proposed the most ambitious financial reforms since the Great Depression. We'll set and enforce clear rules of the road, close loopholes in oversight, charge a new agency with protecting consumers, and address the dangerous, systemic risks that brought us to the brink of disaster. These reforms are moving through Congress, we're working to keep those reforms strong, and I look forward to signing them into law. And because our economic future depends on our leadership in the industries of the future, we are investing in basic and applied research, and working to create the incentives to build a new clean energy economy. For we know the nation that leads in clean energy will be the nation that leads the world. I want America to be that nation. I want America's prosperity to be powered by what we invent and pioneer - not just what we borrow and consume. And I know that we can and will be that nation, if we are willing to do what it takes to get there. There are those who claim we have to choose between paying down our deficits on the one hand, and investing in job creation and economic growth on the other. But this is a false choice. Ensuring that economic growth and job creation are strong and sustained is critical to ensuring that we are increasing revenues and decreasing spending on things like unemployment so that our deficits will start coming down. At the same time, instilling confidence in our commitment to being fiscally prudent gives the private sector the confidence to make long-term investments in our people and on our shores. - The economic assumptions of laissez-faire conservatives (who had dominated our ideological paradigm since 1920) were discredit by the onset of the Great Depression in 1929. - The election of Franklin Roosevelt in 1932 brought about a new period in our nation's political history, one in which the Democratic Party was dominant due to its advocacy of a government that played an active role in bringing about economic justice for working-class Americans. - The next forty-eight years of American political history were dominated by the political coalition Roosevelt established during and immediately after the 1932 election, one in which great social changes were brought about that increased socioeconomic opportunity and upward mobility, brought about an unprecedented period of prosperity such as had never been seen before (both in quality and duration), and significantly expanded the middle class. It will also be remembered for having far-reaching impacts on non-economic matters, such as by causing America to become one of the world's foremost superpowers, obtaining justice for long oppressed groups of Americans (including African-Americans, women, and a host of religious and racial minorities), and encouraging the challenging of established institutions and assumptions in such a way as to stimulate both a cultural revolution (embraced by the inheritors of the Roosevelt legacy in the late-1960s and early-1970s) and a reactionary backlash against said cultural revolution. - The reactionary backlash against the cultural revolutions of the 1960s and 1970s brought about the beginning of the end of the Roosevelt era with the election of Richard Nixon in 1968. However, Nixon's embrace of liberal economic policies (relatively speaking) prevented his presidency from marking a real close to the Roosevelt period. It sowed the seeds of its ultimate downfall, but the Roosevelt paradigm still pervaded through this period. - The election of Ronald Reagan in 1980 brought the period ushered in by Franklin Roosevelt to a final end. This was achieved by playing on the fears of those who rebelled against the impact of the cultural revolution of the 1960s/1970s, in large part by causing millions of Americans to identify the Democratic Party with cultural values they abhorred, and then conflating in their minds the liberal economic policies of that party (which had been previously widely recognized as beneficial) with their shunning of the counterculture. By forging a dominant political coalition through this means, Reagan caused the Republican Party to dominate American politics for the next twenty-eight years, using his power to reverse much of the legislative achievements from the Roosevelt era (1932-1980). This led to a backpedaling of social justice on issues such as women's rights and the fight for racial equality, and more significantly, caused an increase in the socioeconomic inequities that had dominated American life until Roosevelt's ascent to power. - The advent of the Great Recession in September 2008 - which was caused by and brought to a head the growing disparity between rich and poor, the accelerating dwindling of the middle class, and the increasing loss of socioeconomic opportunity and a decent standard of living for millions of Americans - caused Americans to reject the notions of the Reagan era and demand a new period in our country's ideological/political history, much as one had been ushered in by the election of Franklin Roosevelt in 1932 and Ronald Reagan in 1980. Hence Barack Obama was elected President of the United States. After Obama's inauguration, the question was whether he would squander the unique and precious opportunity which history had bestowed upon him, or whether he would act in accordance with the words of his Chief of Staff, Rahm Emanuel, and "never let a serious crisis go to waste" since "it's an opportunity to do things you think you could not do before." I have to admit that, for a very long time, I was concerned that Obama was doing the former, something I made clear in several blog posts (http://riskinghemlock.blogspot.com/2009/11/letter-to-barack-obama_677.html, http://riskinghemlock.blogspot.com/2009/09/obamas-centrism.html). Yet here is a speech that contains the policy substance we need - programs that will actively use the government's power to stimulate job growth, that will attempt to restore fiscal responsibility to our national treasury after three decades of wild Republican profligacy, that will take steps to prevent the future recurrence of this type of crisis, and that boldly attempts to redefine how Americans view the proper role of their government in its economic life. 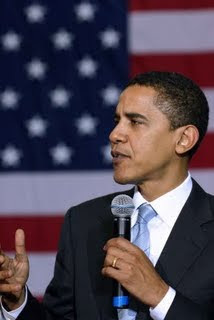 It is the kind of speech that I hoped Obama would make when I first predicted that he would be elected president (on October 6, 2005, I wrote "I, Matthew Rozsa, as of October 6, 2005, hereby predict that Barack Obama will be the 44th President of the United States"). It is the kind of speech that I believed he would someday make when, one year later, I wrote another article expressing my preference for him as the Democratic presidential candidate. It is the kind of speech that encouarged me to volunteer for his campaign in New Jersey for the Democratic primaries and in Pennsylvania during the general election. In sum, by supporting policies that synthesize the economic activism of Franklin Roosevelt with the fiscal hawkishness of Bill Clinton, Obama has crafted a program that can not only get us out of this recession, but usher in a new ideological period in American history. For the first time since January 20th, I have reason to believe that - despite the doubts of his liberal critics and the verbal assaults of his conservative adversaries - Barack Obama may very well measure up to his moment in history. The Age of Obama (Barack Obama...): 2008-??? I don't think there's any question that either side would agree with the quote, but the interpretations would be very different. The problem with conservatives who claim that they agree with that quote's message is that their policies blatantly contradict its objectives. How can you say that every man has a right to make a comfortable living and then oppose economic stimulus measures that create jobs? How can you recognize a right to survive through one's work and then oppose providing universal health care to those who put in a full day's labor and still cannot afford decent insurance? In short, what use is any economic declaration of rights if it does not entail the right to labor empowerment (by cultivating the growth of unions through the EFCA), the right to earn enough through forty hours of work to support both yourself and your family (by raising the minimum wage), and the right to not have one's very security undermined through the reckless cupidity of big business and Wall Street firms (such as would be prevented by the financial regulations that most Republicans oppose)? "It is to be regretted that the rich and powerful too often bend the acts of government to their selfish purposes... There are no necessary evils in government. Its evils exist only in its abuses. If it would confine itself to equal protection, and, as Heaven does its rains, shower its favors alike on the high and the low, the rich and the poor, it would be an unqualified blessing." To me, this battle for America's economic soul is fundamentally the same now as it was when Andrew Jackson and the liberals opposed Henry Clay and the conservatives in 1832, and as it was when Franklin Roosevelt and the liberals opposed Herbert Hoover and the conservatives in 1932. It's a struggle between the ideals of the Democrats of '32 and the conservatives who, though professing the same basic values, actively work against them. Matt, I don't want to get into it again, but the pathology of your comments is astounding. For one, you are assuming that a right to life implies all sorts of other modern comforts, normally earned and chosen. Two, you are ignoring the fact that the left is responsible for the American holocaust of the unborn. Three, you are ignoring the inevitable corruptness of bureacracy after bureaucracy after bureaucracy. Unions? Seriously? Know anyone in any unions? Talk about wasted time, money and favoritism, not to mention a culture reminiscent of indentured servitude. Lastly, you are ignoring that the contributions of the wealthy is what supports both parties. Obama's campaign starts and finishes with support of the elites. Ask my family. I don't know you Jim, but as somebody who works for a union, I would disagree with your assessment. Why would you consider union workers indentured servants when they earn more in terms of wages and benefits than non-union workers? I think those who toil for companies without the benefit of union protection are the indentured servants or more aptly wage slaves in many cases. 1) If you actually read Franklin Roosevelt's comment (you know, the one with which you supposedly agreed), you would notice that he says people have a "right to make a comfortable living." It is not only logical, but morally and practically necessary, to include high quality health care, a sustainable income, and a secure job among those rights, since it's ridiculous to assert that anyone can have a "comfortable living" without those things. Government programs that protect the economic rights of America's working class have a vital role to play in our national life. The fact that there can be inefficiencies and corruptions in these programs does not detract from their overall value, at least no more than the inefficiencies and corruptions of, say, some specific law enforcement agencies detracts from the overall value of having cops. While I do not deny that there are problems which need to be remedied in the manner with which we provide a whole host of social services, the solution is to take bold action in fighting for more efficient and honest government, not in throwing away the baby with the bathwater. 6) While both political parties accept contributions from wealthy donors (a problem that I agree is very real, and should be dealt with through aggressive campaign finance reform), it can't be denied that big business, Wall Street, and the American plutocracy in general has a distinct preference for the Republican Party over the Democratic Party. Indeed, to the extent that your criticism of Obama and the Democrats is germane, it only is so to the extent that it involves both of them BETRAYING their own principles by becoming more Republican in their policies. When the Democrats allow the siren song of campaign funds and well-heeled lobbyists to choose the elite over the people, then they do indeed commit treason against their own cause, and deserve our contempt and condemnation. The ultimate difference, though, is that Democrats who do this are guilty of behaving in an un-Democratic fashion, while Republicans who do this are acting in strict accord with the precepts of their organization. Oh, and a friendly suggestion? Use a dictionary before tossing words like "pathology" into your comments. That'll save you embarassment in the future. That is what it means, and what I meant. Tell me how that is off point. If you disagree, that's one thing, but you can't say there's no use for that word. I don't know why you insist on trying to call me an idiot. I have yet to go after you personally, as you have now done numerous times. I read your limp-wristed abortion defense before, and it fell as short of being adequate then as it does now. And just see what happens when Buffett, Chambers, etc. can no longer bankroll the left. There would be no left. I agree with Jim no need to get personal Matt. Also, the rules regarding grammar and spelling need to be a bit more liberal in this arena especially when using an iPhone or blackberry. You don't need to take it to that level in order to make a persuasive argument. Now fight nice! 1) If you're going to call my defense of abortion "limp-wristed" and "short of being adequate", it would serve both of us better if you explained how and why that is the case. You aren't rebutting me, but simply expressing disagreement. 2) Do you really believe that there "would be no left" if it weren't for the contributions of wealthy progressives? Economic liberalism has a long and rich history. From the days of ancient Rome, when the Gracchi brothers fought for land reform on behalf of the plebians, to the early years of American history, when Andrew Jackson took down the National Bank and Thomas Dorr cast shame upon the laws that made property ownership a prerequisite to voting - in short, for as long as Western history has been chronicled, stories can be found of left-wingers fighting for full-time jobs, the means with which to support themselves and their families, political representation equal to that of the rich and powerful, and a fair opportunity to succeed or fail based on their individual merits regardless of the class into which they were born. If a magic wand was waved that caused Barack Obama, Harry Reid, Nancy Pelosi, George Soros, Warren Buffett, and every other prominent economic liberal to vanish into thin air, the principles for which they fought and the vehemence of the battles they waged would not diminish in the slightest. If you do not believe this, then you have a lot to learn about human nature. 3) You're right about one thing, Jim - there is no reason for me to make jabs about your intelligence. For that, I am sorry.